European clothes drying cabinets take longer to dry clothes, but use less energy, than a conventional clothes dryer. 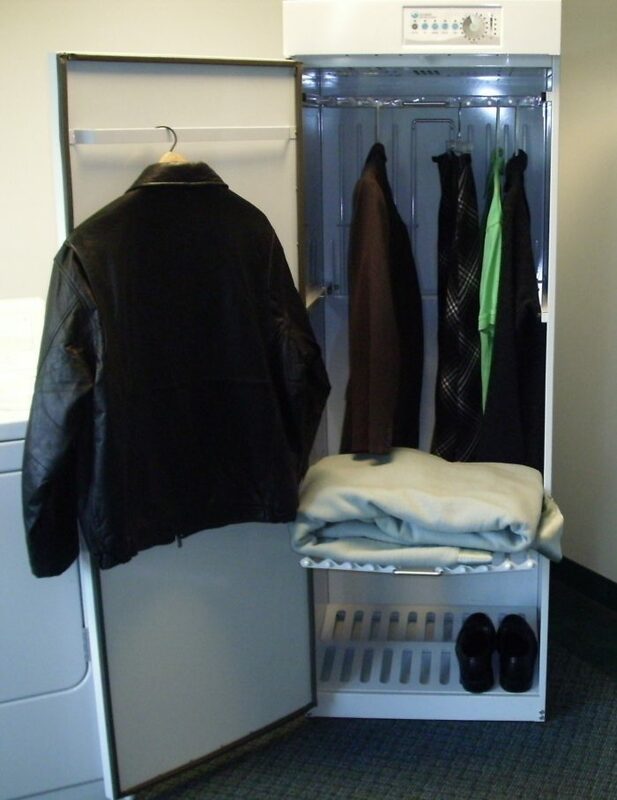 Image Credit: Wikipedia The Staber clothes drying cabinet is manufactured in Groveport, Ohio. It retails for $1,099. Unfortunately, many American families will find the capacity of most drying cabinets to be too limited for their needs. Image Credit: Holly Brooks This photo shows the Bosch Axxis condensing clothes dryer ($1,249) stacked on top of a washing machine. The Bosch Axxis dryer does not require venting to the outdoors. UPDATED on 7/7/2016 with information on heat pump clothes dryers from Whirlpool and LG. In an American home with a relatively new refrigerator, the clothes dryer usually uses more energy than any other home appliance. An electric clothes dryer draws between 4,000 and 6,000 watts, and costs about 60 cents an hour — about $158 per year, on average — to operate. While a gas dryer may only draw 400 watts of electricity, it also consumes a significant amount of natural gas or propane to dry each load of laundry. Besides using lots of energy, clothes dryers can also contribute to depressurization and backdrafting problems. The typical American clothes dryer is vented to the exterior; when operating, a dryer depressurizes a house at a rate of 100 to 225 cfm. This depressurization, especially when combined with other exhaust appliances operating simultaneously, can cause gas water heaters or wood stoves to backdraft. Even when the dryer isn’t operating, a dryer vent represents a penetration in the thermal envelope that contributes to air leakage. Finally, clothes dryer vents are a major cause of house fires, so a house without a dryer vent is a safer house. For all of these reasons, you may be thinking of living without a clothes dryer. Do washing machines have effective spin cycles? Newer washing machines do a better job of spinning clothes to remove moisture than older models. Still, some people claim that a better spin cycle would reduce drying time. One possible solution is a new appliance called a spin dryer. Of course, moving clothes from the washer to the spin dryer, and then moving the clothes again from the spin dryer to a clothesline or conventional dryer, is a hassle. Moreover, these spin dryers have mixed reviews; according to some users, they don’t really reduce drying time significantly. The most obvious alternative to a clothes dryer is a traditional outdoor clothesline, supplemented by an indoor wooden drying rack. Outdoor clotheslines are a badge of honor among environmentalists; my 83-year-old mother still dries all her clothes that way. Unfortunately, some homeowners’ associations and local ordinances restrict the use of outdoor clotheslines. A variety of citizens’ groups operating under the “Right to Dry” banner are challenging these ridiculous restrictions; for more information on their efforts, check out the Project Laundry List Web site. Condensing clothes dryers don’t require a vent; instead of blowing the moisture outdoors, these appliances collect the moisture condensed during the drying cycle and send it down the drain. 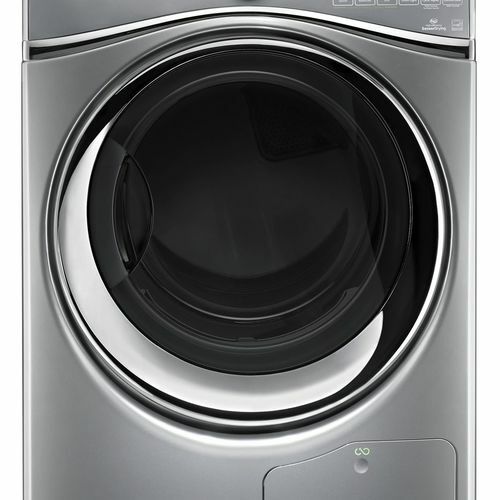 Several manufacturers make condensing dryers, including Bosch, Equator Appliances, and LG. 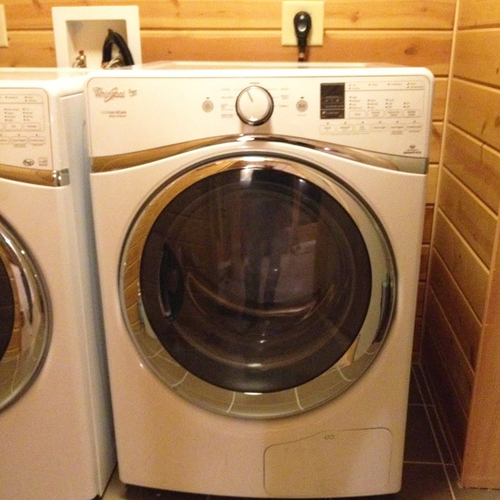 Some are stand-alone dryers, while others are washer-dryer combos with a single drum. These appliances include an electric-resistance heating element, just like a conventional clothes dryer. Unlike most dryers, however, they use cold water from the home’s domestic water supply to provide a condensing surface that encourages condensation. Some models blow the warm, humid air inside the dryer across a copper coil circulating cold tap water, while others have a condensation chamber where the humid air contacts a cold-water spray. 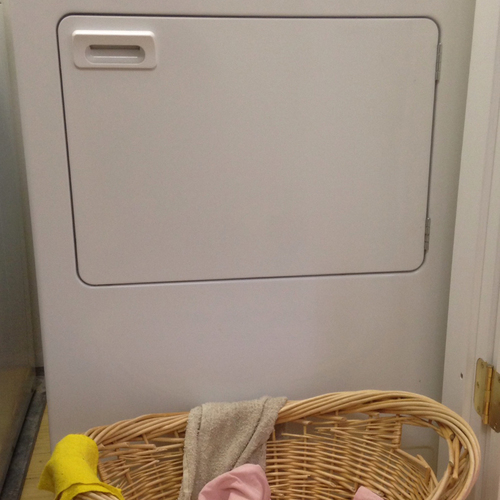 Condensing dryers require a cold-water connection and a drain connection. Here’s how the clothes drying cycle for the EZ 3720 CEE washer/dryer combo from Equator Appliances works: the dryer has a 120-volt electric heating element; the circulating warm air blowing through the damp clothes is brought in contact with a sheet-metal baffle that is cooled by a continuous spray of cold water. Some of the moisture in the warm, humid air stream condenses in mid air, and more moisture condenses on the cold metal baffle. All of the water — both the water sprayed on the baffle and the collected condensation — drips to a sump at the bottom of the appliance, where it is removed by a pump, just like the drain water removed from a washing machine. A normal drying cycle requires 2 hours per laundry load. According to one source, they use more energy than a conventional dryer. Heat-pump clothes dryers work like condensing clothes dryers, except they use an air-source heat pump instead of an electric resistance element to raise the temperature of the air inside the dryer. Like a stand-alone dehumidifier, a heat-pump clothes dryer is a closed system, entirely within the home’s conditioned envelope. Both sides of the heat pump — both the condenser coil and the evaporator coil — are located inside the appliance. Most heat-pump clothes dryers are unvented; like condensing clothes dryers, they collect condensed moisture and send it down the drain. Several European appliance manufacturers sell heat-pump clothes dryers; one of the first models to hit the market was the Ã–ko-Lavatherm WP dryer from AEG, which you can read about here. Another heat-pump clothes dryer sold in Europe is the Bosch EcoLogixx 7 dryer. Energy-Saving Clothes Dryers Hit U.S. Markets. Heat-pump clothes dryers use significantly less energy than conventional electric dryers. The major downside to heat-pump clothes dryers is their high cost — about twice the cost of a conventional electric clothes dryer — and their mechanical complexity. In many European homes, especially Passivhaus homes, clothes are dried indoors in a drying cabinet, drying closet, or drying room. Drying is accelerated with help from a dehumidifier, mechanical ventilation, or a combination of mechanical ventilation and added heat. Drying cabinets can be homemade or purchased, at prices ranging from about $1,100 to $1,250. Manufacturers include Asko, BreezeDry, and Staber. A homemade drying cabinet would consist of a large cabinet with horizontal closet rods or dowels. 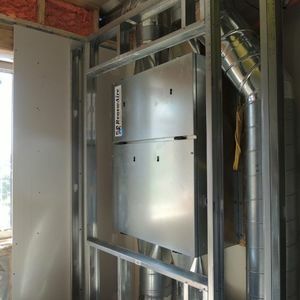 The cabinet should have an air intake at the bottom and a connection to a low-cfm exhaust fan or the exhaust side of an HRV at the top. The inclusion of an electric resistance heating element (the Staber model includes a 1,200-watt heating element) is optional, as is a floor drain. Of course, unheated drying cabinets take longer (but use significantly less energy) to dry clothes than heated drying cabinets. If a drying cabinet is too small for your needs, you could expand the concept and build a drying closet. In a post on one of GBA’s Q&A pages, Lucas Durand suggested locating a home’s water heater in a clothes-drying closet, so that the waste heat from the water heater helps dry damp clothes. Instead of an electric resistance heating element, some drying cabinets or drying closets use a dehumidifier. For more information on drying closets with dehumidifiers, see this British Web page. In a co-housing or multifamily building, a drying closet can be expanded into a drying room. 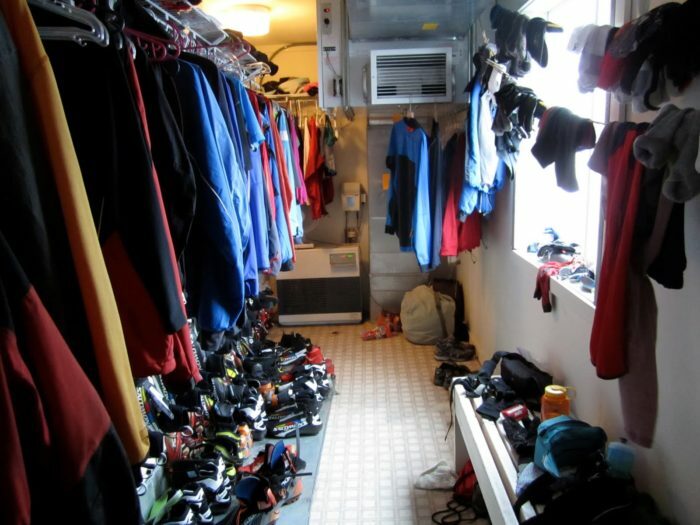 Drying rooms are very common at cross-country ski lodges and in the basement laundry rooms of some European apartment buildings; these rooms typically include exhaust ventilation and a heat source. I’ve been told that the drying rooms in many Swiss apartment buildings and homes use a dehumidifier / fan product called Secomat that has been designed by the manufacturer (Krueger) specifically for clothes-drying rooms. "In a post on one of GBA’s Q&A pages, Lucas Durand suggested locating a home’s water heater in a clothes-drying closet, so that the waste heat from the water heater helps dry damp clothes." In the UK a few decades ago, back when clothes dryers were rare and everyone line-dried their laundry, a standard feature of every home was the 'airing cupboard'. Necessary because in that moist climate line-drying often has somewhat damp results, the airing cupboard was essentially a combined linen drying and storage closet which depended on a poorly insulated (or even uninsulated) electric water heater to finish the job. 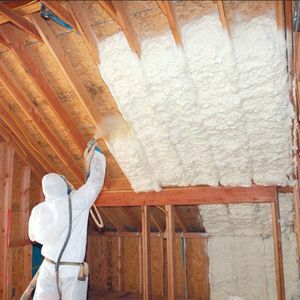 As insulation standards for water heaters improved they became ineffective for that purpose. There's no free lunch. Another technique for those households lucky enough to have a large country kitchen with tall ceilings was a drying rack hoisted on cords high above the Rayburn or Aga cookstove - an oil, gas or coal-fired behemoth typically kept burning 24/7/365 - a desirable feature even in summer to keep the chill off old stone buildings. Dryers seem to be one of the last residential appliances that don't have a sealed combustion connection. Any thoughts on why this is? It would solve the pressurization issue, and prevent conditioned air from being used to dry the clothes. Gas dryers are vented for two reasons: to remove combustion gases, and to remove excess humidity from the clothes. Even if appliance manufacturers made a sealed-combustion burner for the dryer, and used a heat exchanger to keep the flue gases separate from the drying clothes, you'd still need a separate vent to remove humidity. That's why electric dryers (which do not require any combustion) also need to be vented. If exterior air were used to replace the air exhausted by an electric dryer, the energy required to dry the clothes in winter would rise. Clothes dryers use WAY more energy than most refrigerators. At $0.10/kWh, the average clothes dryer at $158/year would use 1,580kWh. You'd have to go back to the 1970's or 80's to find a fridge that used that much energy. Americans with natural-gas clothes dryers spend less on an annual basis, and use less source energy, for clothes drying than refrigeration. Americans with electric clothes dryers spend use more electricity for clothes drying than refrigeration. As with all such averages, the usual caveat applies: "Your mileage may vary." Since all of my clothes are no-iron clothes, your comments have left me scratching my head. I'm not sure what alternative method of drying you want to get credit for when you use your clothes dryer. Are you implying that some people take damp clothes directly out of the washing machine and put them immediately on the ironing board? I'm not only an ironing virgin; I'm a dry cleaning virgin, too. So I have no idea what you mean when you claim to do dry cleaning in your dryer. You wrote, "As insulation standards for water heaters improved they became ineffective for that purpose [raising the temperature of a closet]." I disagree. I have a Superstor stainless-steel water tank insulated with closed-cell foam -- a high quality tank for my solar thermal system. It sits in a closet; all of the pipes in the closet are insulated. It is surprising how warm that closet gets, in spite of the fact that the tank is insulated. If the closet were a little bigger, clothes would dry more quickly there than elsewhere in the house -- especially if the closet had a little fan. Do you have other source/s that show something different? On the source energy issue - I ran some quick numbers for a gas dryer with electric blower, and came up with annual source energy use that is roughly equal to a standard (electric) fridge. I'm certainly on board with the gist of your article, though. Energy use for clothes dryers (electric or gas) is especially large as a percentage of total energy use in otherwise low energy homes! Martin said "More Americans have natural-gas clothes dryers than electric clothes dryers"
Where did you get this impression? Nearly 80% of dryers in the US are electric. Clothing out of the washer come out wrinkle from the spinning cycle, and the dryer "smooths" them out... also you can buy dry-cleaning packs to "dry clean" your clothes in your home dryer. Those are some of those thoughts that wake us up at 3:00am and go hummmm....!!! Thanks to both of you for catching my editorial error; I'm happy to set the record straight. 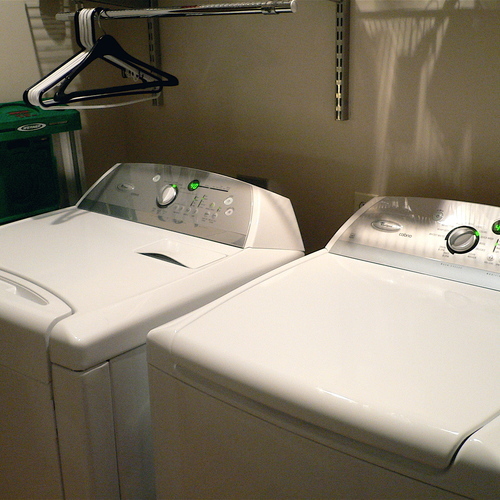 More Americans have electric clothes dryers than gas clothes dryers. I wish heat pump dryers were available in the US. There are several manufactures that make heat pump clothes dryers that are supposed to outperform typical condensing dryers in both drying speed and energy consumption, yet none are available in the US. Is it our cheap energy that is keeping them from being sold here? The more elaborate and expensive the equipment used to dry clothes, the better a clothesline looks. "Energy Efficiency in the European Union"
What about central Air conditioning as compared to these appliances? I would think that is a large consumer of electricity. Martin- Do you really think citing a source from 2001 about refrigerator energy use makes any sense? Refrigerator efficiency standards in 1993 and again in 2001 make any estimate about the existing stock of units from 2001 only useful for concluding that *in 2001* a refrigerator typically used more energy than a dryer. Beginning in 2002 no refrigerator sold used more than 790 kWh and the average units used much less. The average usage value you cite from 2001 is larger than the rated use of every residential refrigerator model sold in the US since 1994. Martin, I don't dispute your observation in your own home but I can tell you from personal observation that the ability of UK airing cupboards to actually DRY moist linens (as opposed to just keeping already-dried items from getting clammy and moldy again) dropped precipitously in the seventies and eighties as better insulation was introduced. But in any case artificially heating rooms or large closets for drying laundry only makes any kind of sense in a heating climate, in the winter. I could not agree more that air-drying at ambient temperatures is the best of all options, wherever possible and either indoors or out according to the season. In rainy climates carports and porches rock! Bosch has made not only a heat pump condensing dryer but also ahead pump dishwasher which have been available in Europe and other countries for a couple of years and they are significantly more energy efficient then their standard dryer/dishwasher. Another option is a clothes centrifuge when typically spin upward of 2500 rpm,as opposed to the best washer which top out at 1300 rpm. Clothes come out with much reduced water content making indoor line drying faster or even unnecessary, and shortens condensor dryer times. "ENERGY STAR does not label clothes dryers because most dryers use similar amounts of energy, which means there is little difference in the energy use between models." There is definitely an opportunity here.
" Moreover, the heat has to come from somewhere; just like a heat-pump water heater, a heat-pump clothes dryer would cool the room in which it is located." A heat pump dryer operates like a dehumidifier: it cools one end and heats the other. It's a closed system which moves liquid water from laundry to a condensing coil. We have a drying room in the basement about the size of a walk-in closet that uses a portable dehumidifier. All my clothes except underwear dries in there. It is amazing how nothing shrinks now. Q. "What about central air conditioning as compared to these appliances?" A. The discussion concerns the energy use of appliances (refrigerators, clothes dryers, clothes washers, dishwashers, chest freezers, etc.) Such a discussion generally excludes the energy used for space heating or space cooling. Of course you are right that the energy required for space heating (in northern climates) and space cooling (in hot climates) generally exceeds the energy required for any individual appliance. As usual, your comments are pertinent; thanks. You wrote, "Do you really think citing a source from 2001 about refrigerator energy use makes any sense?" I agree with you -- the energy use of refrigerators has been dropping, and the data I cited are old. I will edit the blog to reflect your point. So, GBA readers, here is the takeaway: if you have an old refrigerator, it's probably using more energy than your clothes dryer. If you have a new refrigerator, your clothes dryer is probably using more energy than your refrigerator. Thanks very much for clarifying how a heat-pump clothes dryer moves heat; I appreciate your explanation, which I'll repeat here: "A heat pump dryer operates like a dehumidifier: it cools one end and heats the other. It's a closed system which moves liquid water from laundry to a condensing coil." It seems to me that the question of whether such an appliance raises or lowers the temperature of the room in which it is located (or has no effect on room temperature) depends on whether the temperature of the water that goes down the drain is higher or lower than the room air temperature. I'd love to hear a clothes-drying guru respond to your setup: "We have a drying room in the basement about the size of a walk-in closet that uses a portable dehumidifier." Has anyone studied which approach uses less energy: a clothes-drying closet with a dehumidifier or a clothes-drying closet with electric resistance heat? I can assure you that I understand the difference between "sealed combustion" and "non venting." My response to Nathan Kipnis explained the reasons why dryers are vented; I never argued that providing ducted exterior air to a dryer was a bad idea. You may well be right that the energy required to raise the temperature of outdoor air in winter is less than the benefit (presumably, shorter drying time) provided by the fact that exterior air in winter is dryer than interior air. You wrote, "I simply cannot see the downside of using unconditioned air to dry one's clothes." There is a downside, and it is the main reason that appliance manufacturers don't provide a provision for ducting exterior air to dryers: such appliances would require a second hole in a home's thermal envelope, and a second run of ductwork, and these requirements would complicate dryer installation and make the appliances more expensive to install. That doesn't mean that energy nerds wouldn't jump at the chance to install such an appliance. But it explains why Sears doesn't sell them. I met someone who had a box on black asphalt just outside his basement door with a black coil of water hooked to a pump. he had the box vented to the inside and told me it blows warm air on sunny days in winter in zone 5A. a design ripe for drying garments? High efficiency dehumidifiers use about 0.25 kWh per pound of moisture removed compared to about 0.5 kWh/lb for an electric dryer. But the dryer shuts off when the clothes are dry while the dehumidifier may not provide the same level of control. Another complication is that the dryer exhausts indoor air while operating and the dryer operating energy is directed outside, while the dehumidifier does not increase air leakage or direct any waste heat outside. The impact of these differences will vary with climate. Every house I have lived in this would amount to less than 6 feet. In my current house it would cost 20 bucks if the machine was designed for it. With the ever growing tightness of all construction, I am surprised there is no push at all on this. Atmospheric heating appliances are on their way out, why not low tech dryers? In a world of 2 working parents, I do not see the standard dryer giving way to alternatives, no matter how cool and efficient they are. I'm retired and have a limited income, but I'll pay the $160/year to run the electric dryer rather than have to hang wet clothes. Some of you must be anticipating that your wives are going to cheerfully do this chore. Thanks for tracking down the facts -- good post. The typical US dryer is vented. That means in the winter, it steals an additional 3.56 kwh of space heating from the house*. $0.12/kwh electricity cost, that's $0.82 per load. 3. Connect to the bottom of your water heater. 4. Turn off the lower heating element of your water heater. 5. Have this assembly come on automatically whenever it gets hot in the laundry room. 6. Sit back and let the unvented dryer's waste heat preheat your domestic hot water. *assuming 250 cfm for the dryer, 30 deg. F outdoor temperature, one hour cycle. I guess you're one of those engineers or DIY tinkerers who loves spending every weekend troubleshooting problems in your equipment with a a propane torch, a can of flux, and a roll of solder. First of all, you wouldn't use a kickspace heater -- the blower on the unit (along with your proposed circulating pump) would probably use more kWh than the thermal energy you are trying to gather. If you really want to rig this nutty system up, you want to use a ceiling-mounted air-to-water heat exchanger. Install a wall-mounted thermostat near the ceiling to control the circulator -- set to go on at temperature rise, off at temperature fall -- and set the thermostat at about 80°F. Of course, that means that you'll have to explain to your spouse why it makes sense to hang what looks like an automotive radiator from your ceiling. The reason you need to install it near the ceiling is, that's where the heat is. Not under your vanity near the floor. And I still think the parasitic energy needed to run the pump will cancel any thermal benefit. But it sounds like a fun project if you are the type of guy I think you are. you can vent electric dryers indoors with various kits to recapture the energy and bonus humidity. This particular blog of great interest to me. Over the past TWO years I have been looking and digging , checking, and exploring many alternatives to the standard clothes dryers. This winter I finally replaced my 25+ year old natural gas Sears dryer with a newer natural gas Whirlpool dryer. I have been holding out on the replacement for several years - eagerly waiting for the next best thing! The truly amazing item - is that the newer mid-price natural gas dryer is less than 20% better than the 25+ year old bottom of the line Sears dryer in energy use. Trust me on this - I have lots of numbers both the plate and actuall measurements... (engineering types like to measure stuff). We do have TWO drying racks that we use for clothes as needed - and outside we have two of the most efficient solar energy drying lines possible :-), However I live in the Seattle area and drying the clothes outside during the winter time can be a VERY slow process. An indoor clothes dryer is very useful. 1) Your geographic location and weather conditions can make a huge difference! If you life in an area that is dry and warm - you can dry your clothes outside quickly. And even if you get an unexpected shower --- (it happens) the clothes will redry quickly. So an important consideration is the humidty and temperature condtions that are common in your area. Try drying those real wet towels indoors in very humid envrionment -- and it takes days. 2) What is your time limit? (or requirements). As noted some of the condensing dryers take nearly twice as long as the standard dryer. If you have time constraints - the temptation may be (I know for me it is) to run TWO condensing dryers at the same time to get the loads complete. I have traveled and done laundry in Europe and yes while they are more efficient - the dryers do take longer. Also in some cases you MUST remember to empty the water recovery bin FIRST. 3) I use natural gas -- more efficient right? Well maybe. The btu input for many (perhaps most) gas dryers is about 22,000btu/hr. That is roughly equivalent to 6.4KW of electricity. We don't see energy star ratings (yet) because the input energies thus far are nearly identical (give or take a few KW). While I use natural gas, they actually use more than that 22,000btu/hr. You also need electrical energy for the blower, tumbler and gas igniter (often a glow bar). Remember my old 25+ year old dryer? Well it used about 800watt/hour of running. New dryer uses about 20% less. Both had the same gas btu/hour input. 4) For electric element/natural gas dryers - that motor that powers the blower and tumbler are often one and the same. AND they may be rather inefficient split phase capcitor motors. On my new gas dryer - the running power factor is about 0.5 NOT VERY good. An equivalent dryer using a electric element may have a power factor much closer to unity -- because the resistive component would be much higher than the reactive losses in the motor. In some parts of the country - utilities are looking at or adopting billing based on the power factor at the meter - billing us like they do to commercial entities if the power factor is way out of whack. 5) I always thought the Pacific NW had one of the lowest gas and electric rates. Last winter had it made very clear to me (comparing bills with relatives) that other regions of the country may have far lower electric and gas rates. If you are in area where the gas price is $0.50/therm -- and the electric rate is $0.09/KWh the choice would be to use gas. Your local energy costs can significantly change how you look at an appliance. 6) As an engineer, I thought of and sketched many different means to make a "more efficient dryer", but in general it comes down to the economies of scale (how many will be sold) and at what price. If the latest and greatest dryer is going to cost $2000 and it is only $500 for the less efficient model are you spending money wisely? Add in the consideration that the less efficient model may be built on an assembly line that uses less energy per built dryer compared to all the energy to build those few fancy dryers and the decision becomes more difficult. From my perspective - I would still greatly appreciate an energy star rating for dryers. However the question that perhaps has been holding up the show for the scores -- is how do you compare dryer choice A, B and C? I would propose that "standard" bath towels, T-Shirts, etc. be defined. The thread count, dry weight can be carefully measured. You then add a pre-measured amount of water to the "standard" load. Dry for 20, 40, 60 minutes ( Auto moisture) settings. Measure the weight of the "standard" load. Report the score for the time required -- plus the energy used (both electric, gas, etc.) If the dryers pull air from the house and vent outside - include the # of cubic feet of air that is vented for the set times above. Include in scores for the consumers to see and compare. I looked hard for the numbers I could compare. I found nothing!. Nothing to be found. If as consumers, we want dryers to improve in efficiencies as we have seen with washing machines. We need to have scores that we can compare. If we want good numbers for comparing - we need to be asking the manufacturers and perhaps the energy star folks. It will take more than a few to ask -- manufacturers are not likely too provide the numbers first - without a standard -- because they have a lot to loose. A standard method of measuring must be developed and adopted!!! As for building a dryer yourself - you still need good numbers and measurement methods to know if what you've built is better or worse. I would still prefer gas (my preference)... I would love to see a dryer that offered separate electronically commutated motors for the blower and tumbler. Very speed for both as needed -- plus electronic spark ignition for the gas... and a signal to open air damper (fresh air replenishment). Fisher-Paykal(sp?) had some of the more interesting dryers - but not long on the market -- and this year there was a natural disater in New Zealand that impacted their production. (bad timing for me). One area alluded to - but not addressed is what devices are available to balance the air coming into the house when a dryer is running. A new dryer should be able to send a signal to open an air damper for replacement air. No such feature has been sold in a dryer as far as I know. I would like to see a future "Musings of an energy nerd" to address how to provide an automatic make up of air for devices like the dryer. We use a 370W dehumidifier in a closed room ( utility room as it happens ) and it works really rather well. Heavy items such as towels take a while, but general stuff dries in a couple of hours. Man made fibres dry in no time. We can get a surprising amount of water collected too - used to water plants mostly. The room is also on the extract side of the whole house heat recover / ventilation system, so any latent heat released by the dehumidifier then goes in to the whole house heat exchanger and warms the house ( after all, it's only needed on dark cold days, as the rest of the time we hang our clothes outside). I have no separate energy use figures for this setup, but our electricity use does not significantly increase during use, as three hours is only 1110W and that is about offset to an extent by the gain in house heat, and hence reduction in boiler usage - both gas and electricity to pump the water. It never ceases to amaze me, btw, that there are so many people in the US that are bound by restrictive rules, mostly brought about by the vanity of the law makers or public opinion. Thanks to both of you for your perceptive and detailed posts. I continue to be amazed at the range of experience found among GBA readers, and our readers' generosity in sharing useful information. Keep the good information flowing! Can anyone provide more exact specifications for making a clothes drying cabinet. * Circulation techniques to ensure good airflow to all areas. 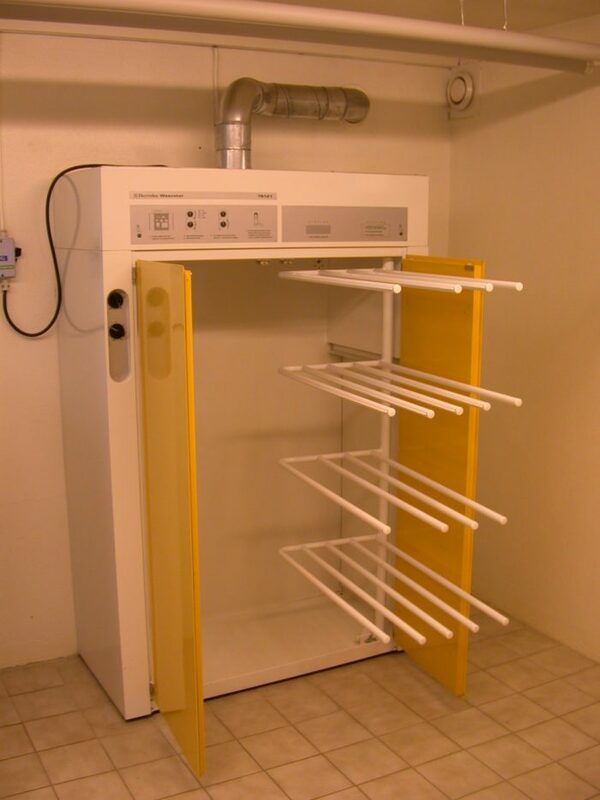 I understand that Thorsten Chlupp has experimented with drying closets. Does anyone know the details of what he's developed? I would buy the smallest available dehumidifier -- it's easy to find 35-pint dehumidifiers with humidistat controls on the Web for $160 to $220. If you buy a dehumidifier with a humidistat control, it doesn't need an additional control. Or you can hook it up to a crank timer if you are worried about energy use. If you are using a dehumidifier, I don't think you want an exhaust fan. The idea is to let the dehumidifier lower the RH of the air in the cabinet or closet. I would build the cabinet out of ordinary materials, just like a kitchen cabinet or a bathroom wall. Water-resistant drywall should be fine, although you could get fancy and install ceramic tiles on the wall if your like such details. Buy a commercial shower base for the bottom of your cabinet, complete with drain, or install a waterproof floor and drain for a larger closet, just as you would build a shower base in a bathroom. If you don't want the hassle of a floor drain, install sheet vinyl on the floor. You should be able to get a small scrap of sheet vinyl for free from a local flooring contractor. Use your imagination for rod spacing and hooks. Rods and hooks can be adjusted until the arrangement seems workable for the types of clothes you're drying. 1. Building codes require an outdoor vent for mechanical dryers. 2. The Japanese have microwave clothes dryers. 5. Riversong, (IIRC), builds air-tight, insulated laundry rooms with a passive inlet vent for the dryer. This is a pretty good solution for summer and winter in all climates, with present day US dryer offerings. 6. The uptake of dryer cabinets and outdoor drying will be small in the US if you can only save $100-$200/yr. 7. I've tried the smaller combo washer/dryers in 4 rental apartments. In all cases these had to be replaced because of poor dryer performance. That's a great list of random comments. Thanks -- I have decided to include information in the original article on house fires and spin dryers. Concerning code issues: section M1502 of the 2006 IRC and the 2009 IRC requires dryer exhaust systems to "convey the moisture to the outdoors," but also notes that "this section shall not apply to listed and labeled condensing (ductless) dryers." Engineers have tinkered with microwave clothes dryers for years, but have repeatedly faced technical hurdles, the most significant of which is arcing -- that is, electrical arcing when metal objects (coins left in a pocket, bobby pins, miscellaneous metal objects that are part of clothing) are inserted into the dryer. Such arcing can cause clothes to catch on fire. To read more about these problems, click on this link. Do you have a link or a reference about the Japanese microwave appliance? Is it on the market? Re: Japanese microwave dryers are cited in Wikipedia, but I couldn't verify, sorry. http://en.wikipedia.org/wiki/Clothes_dryer#cite_note-0 Maybe someone who has lived there can corroborate. I'm building a tightly sealed house (goal 1.0ACH or better) with a passive solar heating component. It will have an HRV. So I'd like to keep the number of through wall penetrations to a minimum. It would also be great to recapture the heat the dryer produces. Although we don't do that much laundry since it's just 2 of us I am a little concerned that running a dryer with internal could produce excess humidity. The internal venting kits I've seen seem like little more than glorified lint traps. Has anyone seen anything designed for indoor venting that has a condenser component to it to remove or reduce the amount of moisture coming out of a conventional dryer? Trying to extract the last little bit of heat from the moist air will result in the moisture condensing on the inside the back side near the dryer - or some place a long the dryer vent line. The moisture will collect lint. The lint builds up faster and then slows down the air flow. Slower air flow means the dryer efficiency drops -- A LOT. It becomes self defeating. The lower the dryer efficiency - the more the lint -- lint insulates the vent pipe and reduces the heat you can pull out of the stream for re-use.. The condensing heat pump dryers handle this in much the same method as a dehumidifier - they collect the water in a bucket that is somehow drained. Since the condensing dryers do not vent outside - they are not sending the heat outside of your building envelope. Make up air is not needed. The biggest complaints I have with the condensing/heat pump dryers is that they are slower. They get you there with very little energy use. But some patience is required -- not of the toss it in and blast the clothes dry. The internal venting kits -- even for an electric dryer can damage a house beyond repair. In my opinion (again) - they really only are useful in VERY dry climates where you MUST use a humidifier to add back in moisture. In those cases most of the humdifiers have some kind of humidistat that compensates for the extra dryer moisture. If you ignore the climate in your area and it is humid- vent the extra moisture into the house - you WILL HAVE MOLD problems. Very few home owner insurance policies cover mold - and certainly none would cover any damage if they find out that you dumped the extra moisture into the house. Point being is that for electric venting dryers the only 100% safe way to recapture the heat is to use the condensing heat pump dryers. (100% safe defined as it works anywhere, anyplace anytime). I do like the idea of a drying closet with a dehumidifer - a simple solution - especially for the hang drive clothes. You sound like a North American, and I thought that we cannot buy any heat pump dryers here. We can get condensing dryers, though. (eg,, LG and Bosch) You mention condensing/heat pump dryers, though, so I'm wondering if I'm wrong. What is the make and model of the dryer you are talking about? Neither condensing nor heat pump dryers need an exterior vent. But a heat pump dryer uses half to a third as much energy as a condensing unit, so it's preferable, especially in the summer. I used condensing/heat pump to clump both kinds into the same group. I have solar PV and have been becoming extremely picky about appliances that use electricity. I know that the condensing/heat pumps would use less energy, perhaps even less electricity than the standard natural gas dryer - my biggest complaint is the lack of really good metrics (US) that can be used prior to making the purchase. The European system offers a scale - but it really isn't possible to compare the US market ready dryers against the European market ready dryers. I live in Ohio in an older 1928 home. I usually hang dry my cotton polo shirts since they will shrink in the heated dryer. In my basement which is not "finished" per se, next to the Staber washing machine I have a wire rack that was originally supposed to be used in a closet, it is hanging from the floor joists above with S hooks and "dog" chain. Then I turn on my oscillating floor fan on high and let it sway back and forth blowing on the wet shirts. Because the Staber does such a super job removing water from the clothes during the spin cycle it may only take 1-2 days to dry completely. In the summertime I run a dehumidifier anyway and this helps as well. I use the top shelf to store my softener, bleaches etc. The rack is about four feet long and it can hold about 9 shirts, this gives some room between each shirt for circulation. I use clothes pins to "anchor" the hangers otherwise they can be blown together. I have considered "ducting" the dehumidifier somehow to see if this would reduce drying time, I'm thinking of using a shower curtain or two as enclosure, simple and cheap. If I don't use a fan and let them dry "naturally", they can smell moldy in the summertime months...yuck! I might be able to mount a box fan so it blows up or down into my shower curtain room.Those fans are pretty cheap anyway. Otherwise I use a gas dryer with a "dry sensor" and love it. Sure keeps from guessing how many more minutes to run the dryer. And only a couple of times did it let me down. Each case the sheets twisted themselves into a knot and the center did not dry correctly. Does it "over dry" the clothes? Dunno, my gas bill is pretty low during the summer months. I dry about three loads a week. So maybe I'll work on a project this summer to see if the dehumidifier helps. At the very least I will use my Killa-watt meter to measure all of the devices just to see what power they do use. Neat article! Not to be confused with currently available steam dryers which just inject steam to help with wrinkles and sanitization. We are planning to build a tight (0.5 ACH @ 50Pa) house in the Canadian sub-arctic. Winter indoor humidity is often below 10% in typical houses due to the very cold outdoor air. Post #47 mentions indoor venting as acceptable for very dry climates ... would anyone be able to put a number on how dry is dry enough? I imagine that - if we achieve the air tightness we want, our home will have higher winter humidity levels than the leaky ones. But if our humidity levels got too high could we not use the HRV controls to get rid of the humidity while keeping most of the heat? A gas dryer should never be vented indoors, because the exhaust has combustion by-products. If you want to experiment with venting an electric clothes dryer indoors, go ahead. If your windows start dripping or freezing up, it's too humid indoors. If you don't end up with wet windows, everything is probably OK.
Back in 2011 in this comment thread, I asked why dryers don't have sealed combustion connections. It did have to do with non-venting. Just as higher performance furnaces and water heaters are not using conditioned air for combustion, it would seem to me that it would make perfect sense to bring in an outside sealed combustion line for a dryer. I read your response that that adds cost, and I understand that. That generally isn't a fatal flaw in GBA discussions. It just seems like it is the largest combustion load left in the house that doesn't use outside combustion air. For those blessed with tall cast iron radiators in their homes, a drying rack next to the radiator does a great job! All winter long, we keep a drying rack in front of the radiator in our bedroom. It handles all the light stuff and even jeans. We use our electric dryer for sheets (too big for the rack) and we often partially dry towels, then transfer them damp to the rack, to speed drying times. Another bonus: it adds a little moisture to our dry winter air. In sunny Florida my attic is always warm. Would there be any problems running a duct down from inside the attic to the air intake on my electric dryer? There are a few caveats. First of all, your clothes dryer needs to have an air intake grille that can accommodate a duct boot. As far as I know, not all dryers can do that. Second, any such retrofit will make it hard to move your dryer, and may discourage you from cleaning out the exhaust duct, which periodically fills up with lint. Third, you need to make sure that you choose a large enough duct size, and run the duct with as few elbows as possible, so that the air intake duct doesn't introduce so much static pressure that the dryer is starved for air. 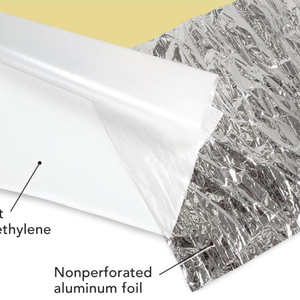 Fourth, the duct will be a penetration in your home's thermal envelope, and will allow interior air to escape into your attic when the dryer is not operating. Fifth, the energy saving benefits from this approach are likely to be small, and I think it's unlikely that the benefits will justify the hassle and expense. In fact, the energy bill increases associated with the exfiltration through the duct into the attic when the dryer isn't operating may exceed any energy bill savings associated with shorter dryer run time. Staring at the "Large Appliance" band of my BEOpt output makes me realize I need to stop fussing over wall assemblies and windows and start thinking about appliance and plug loads. This led me back to the interesting and ultimately disheartening discussion. It is painfully obvious that the modern convenience of rapid electrical drying of clothes does not mesh well with energy efficiency. Case in point: after about 5 years of living with an all-in-one LG washer/dryer combo, I have found that my laundry habits have completely changed. Instead of saying "today is laundry day" and plowing through mountains of laundry, washer/dryer/washer dryer, I now just periodically throw a small load of laundry in before I leave for work or before I go to bed, and return many hours later to a washed and dried pile of clothes. So smaller loads are happening more frequently. It is more akin to a dishwasher, and once part of life, difficult to go back from... imagine if you had a dishwasher and a dish drier and had to switch the dishes between loads? I know this gets into the murky area of behavior modification... but so do drying closets and clotheslines. I'm just pointing out that if you wash 1/2 of the stuff, you'll cut your laundry energy and water usage in half. You are discussing a concept taught in Energy Saving 101. If you now drive a car that gets 22 miles per gallon, you can reduce your energy use 50% by buying a car that gets 44 miles per gallon. Or you can simply drive half as much as you used to, and use your bicycle for the other trips.